Are You Fully Plugged-in to Your Body? Download Your FREE Marvelous Messages Kit Now. Migraines, sinus, chest congestion? Female issues? Bad digestion? Cranky knee, sore shoulder, tennis elbow, hurt all over? Much like interpreting a dream, you can transform these and other symptoms into a personalized, unique-to-you message of hope, peace, and possibility. More importantly, are you trapped in a vicious circle where it seems as just as you get through one difficult life situation, you find yourself caught up in another? Like me, you may find you don't just need a cure, you need a life transformation. The Marvelous Messages Cheat Sheet is everything you need to know to get started exploring the deeper emotional connections of your ailments. The Marvelous Messages Chart is a place for you to map what ails you. Many people are surprised by just how many aches and pains they really do have. *Marvelous Messages is not designed to replace medical care. Always seek a professional practitioner for any serious ailment or symptom. Yes! 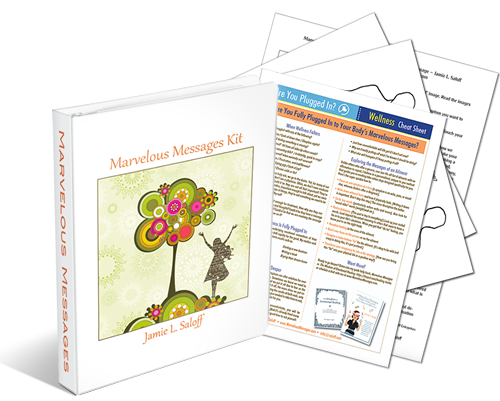 Please Send the Marvelous Messages Kit PDF & E-Course!